Single-sponsor State Farm FCU reduces branch count while executing an enhanced service strategy that drives industry-leading efficiencies. The single-sponsor credit union has five branches at State Farm company locations in four states. A streamlined product lineup and sponsor support allow the credit union to operate highly efficiently. The credit union’s staff are also State Farm employees, allowing them to “speak the same language” as members. State Farm FCU ($4.1B, Bloomington, IL) was founded in 1936 to serve employees and agents of the Illinois-based insurance giant. The credit union’s branch network grew nationwide along with the company, but as times have changed, so have member distribution and needs, and last year the credit union went from 23 branches to five (listed here) at State Farm corporate locations in Illinois, Georgia, Arizona, and Texas. The credit union now focuses on nationwide digital and contact support and believes that flexibility will position it well to continue the deep engagement and strong efficiency metrics it has posted for years. 6 New Branches. 4 More On The Way. The credit union offers auto and personal loans as well as a few savings products but no checking accounts. That might seem like a light menu, but its member penetration rate is 74.72%. And those members are engaged. 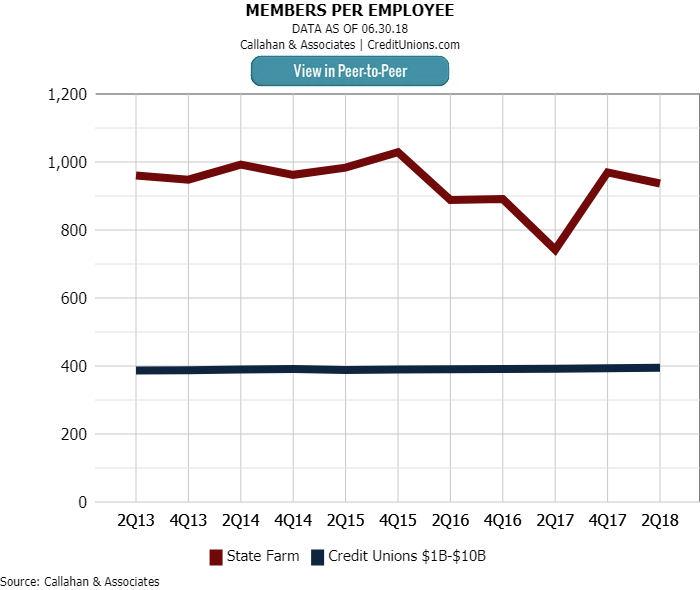 The credit union’s average member relationship as of second quarter 2018 was $34,876, compared with $21,108 for credit unions with $1 billion to $10 billion is assets. Productivity and efficiency metrics are similarly well above asset peer group average. President and CEO Tom DeWitt attributes that performance to a slim product lineup, competitive rates, strong member service, and inherent efficiencies that come with its FOM relationship. DeWitt has been the credit union’s top manager for 22 years. He’s been an employee of State Farm for 27 years and is currently a director of the insurer’s HR team. Here, he discusses the why the credit union shrank its branch system and how it plans to enhance member services. Our sponsor’s evolving staffing and location strategy prompted us to take an in-depth look at how we could best balance our branch presence with the need to provide virtual support to members across the country. What prompted State Farm FCU to reduce its branch footprint from 23 to five? 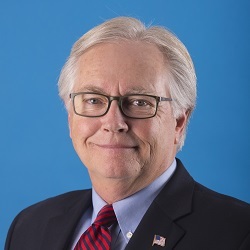 Tom DeWitt: As a single-sponsor credit union serving State Farm employees, agents, retirees, and qualifying family members, we take our mission of offering great rates and convenient service seriously. This includes not only anticipating the future needs of our members but also managing expenses in a manner that allows us to continue providing financial benefits. Describe the credit union’s branch strategy. TD: We remain focused on maintaining locations within State Farm facilities where we have the highest concentrations of employees. Whereas it would be impossible for us to maintain a physical presence everywhere we have members, moving to a centralized, virtual support model with fewer branches in select locations provides flexibility to meet our members’ needs both today and in the future. This approach, coupled with increased digital functionality, allows members to engage us in the manner they choose. State Farm FCU has been around since 1936. How long did it take to get to 23 branches, and was that the most you had at one time? TD: I believe at one time we had as many as 26 individually federally chartered State Farm credit unions. As the company opened new regional offices, an entirely new credit union was opened. As State Farm’s structure changed, so did ours, and we ultimately consolidated into one credit union with multiple branches. How did you decide which branches to close? TD: We looked closely at our existing branch structure as well as our sponsor’s future location strategy. Whether community-based, multi-SEG, or single sponsor, any credit union can benefit from the best practices in delivery channel strategy shared by Tom DeWitt, president and CEO of State Farm Federal Credit Union. Find out what members need, and build the credit union’s location and channel strategy with that in mind. Don’t be afraid to make large-scale changes. More importantly don’t be afraid to adjust course even if the end result looks different than anticipated. Start communicating early, and keep staff informed of both the vision and the impact of changes along the way. Develop channels that let members decide how they want to engage. Some want branches, some want to speak over the phone, and some want to do everything online. Embracing those differences and providing multiple options gives members what they need, when they need it. How did you communicate that decision to members? TD: We communicated with members through a variety of channels, initially introducing the concept during our annual meeting. Most of our members are current State Farm associates and agents. These individuals likely already follow the company closely, and we communicate through internal State Farm channels of communication. As work progressed, we provided ongoing updates to all members through direct mail and used our website to get information out in a timely, easily accessible manner. How have you stayed so successful with such a tightly defined FOM? TD: Because our field of membership is so tightly defined and directly linked with our sponsor, we focus on providing unique benefits and service focused on the needs of State Farm employees, retirees, agents, and their families. The convenience of our branches being located within State Farm facilities is a big bonus, and our focus on conservative expense management allows us to consistently offer competitive rates. Also, the fact that State Farm Federal Credit Union staff are also State Farm employees cannot be overlooked. Our staff understands the needs of State Farm employees across the country, and we speak the same “language” as the members we serve. In that respect, our members are not just our customers, they are our co-workers. How do you serve so many members from so few locations? TD: State Farm Federal Credit Union maintains a physical presence in cities where we have a sizable employee workforce, making us accessible in person to thousands of our members. Technology, including contact center and online banking options, allows us to serve many customers without actually seeing them face to face. We also encourage employees to use automatic payroll deposits to take advantage of our competitive dividend rates. Our members can build their family’s financial security with little effort by taking advantage of automatic savings account deposits. Others take advantage of automatic payments to our competitively priced loans. A simple product lineup and a supportive single sponsor has helped State Farm Federal Credit Union post efficiency measures far higher, or lower depending on the metric, than its asset-based peer group of $1 billion to $10 billion credit unions. Click the tabs below to view graphs. 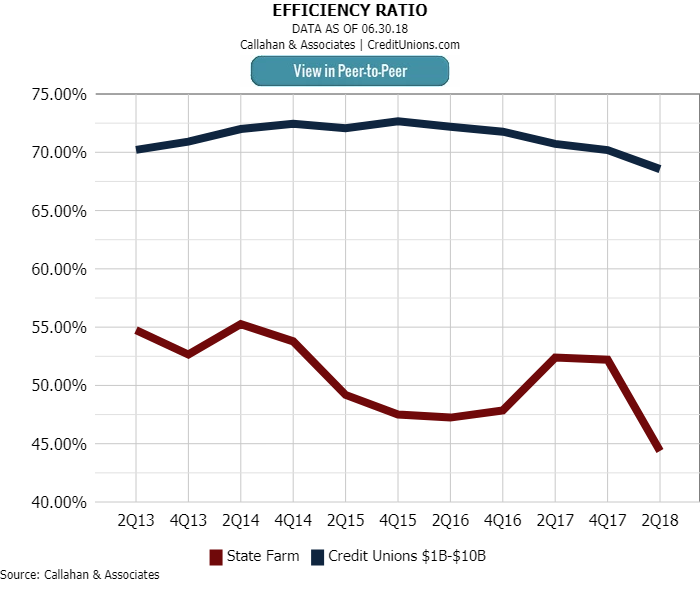 The credit union’s efficiency ratio of 44.38% in the second quarter was the second lowest among credit unions with $1 billion to $10 billion in assets, according to data from Callahan & Associates. 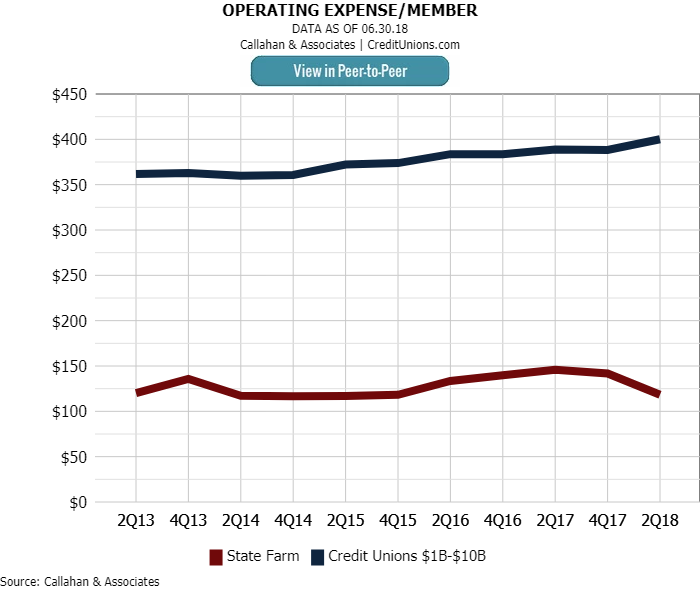 State Farm Federal Credit Union’s operating expense per member in the second quarter of 2018 was $118. That’s the lowest in its asset-based peer group, which had an average of $400. Operating expenses include employee salary and benefits, travel and conference expense, office occupancy, office operations, educational and promotional expenses, loan servicing, professional services, and operating fees. Operating expenses to average assets reflects both the operating efficiency and the operating strategy of a credit union. State Farm Federal Credit Union’s streamlined branch operations and product line combined with low-cost channels makes it one of the most efficient cooperatives in the country by this measure. 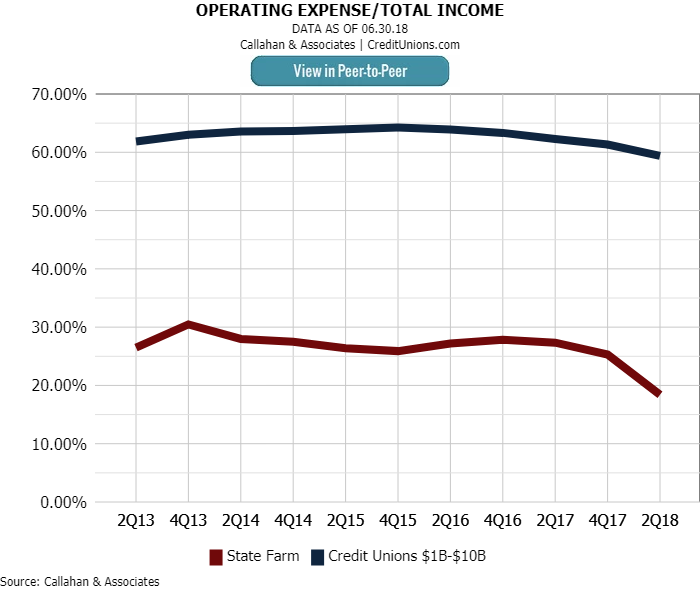 The credit union’s operating expense to total income was 18.41% in the second quarter. 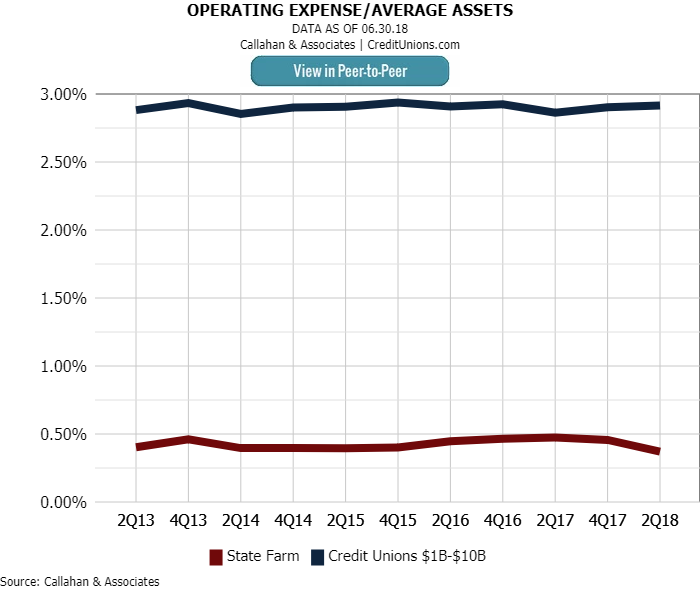 That’s the second lowest in its asset-based peer group, meaning the credit union is spending less of the income in generates on operating the enterprise. The credit union serves 937 members per every full-time equivalent employee. The average for credit unions with $1 billion to $10 billion in assets in the second quarter was 395. The data in this article is pulled from Callahan's Peer-to-Peer. Find out how Callahan Analytics can help your credit union benchmark performance the right way. Learn how. The credit union doesn’t offer credit cards or checking accounts. How do you remain relevant and sustain that model, which harkens to the original role of credit unions? TD: We are not a full-service financial institution, but we do play a key role in our members’ financial lives. By offering great rates on savings, low rates on loans, and service tailored to our field of membership, we are able to provide benefits that work as part of our members’ overall financial portfolio. Additionally, our partnership with other State Farm employee benefit programs and business areas helps ensure our message is heard across the organization. We constantly stress to members and associates who have not yet become members the importance of achieving financial security. The more financially secure our associates become, the more they can focus on helping our customers achieve their own dreams through the products and services we offer across all of our State Farm-affiliated companies. Your metrics “per FTE” are generally quite high, and your efficiency ratio is quite low. How do you achieve such efficiencies, and how do you maintain member service while doing so? TD: For our size, our staffing numbers are low. We have not needed to increase staff because of our non-complex product offerings. Also, as a single-sponsor credit union, we enjoy continuing support from our sponsor, which keeps our expenses down. I consider State Farm Federal Credit Union to be one of the most valuable benefits State Farm offers me as an employee. It has helped me build financial security by providing loan rates that allowed me to control, and eventually eliminate, my debt. Their dividend rates and payroll deduction options have made saving easy and profitable. I just can't promote the credit union enough. I tell all new hires to open an account, right away, and take advantage of what they have to offer! Thanks for taking the time to comment, Ginger. State Farm FCU is certainly taking the traditional credit union role and approach into the future in ways that you and your colleagues can benefit from for years to come.